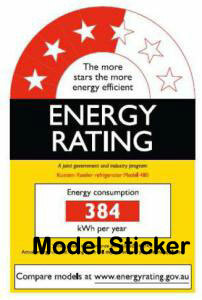 Energy Star sticker is seen in current hungry appliances like Fridge and Air conditioner. This indicates the energy efficiency of the appliances. Energy star denotes the international standard of energy efficient products implemented in 1992 by the Environmental Protection Agency and the Department of Energy .It was started in United States of America. The Devices carrying the Energy Star service label generally use 20–30% less energy than required by federal standards. So by comparing the stars, the consumer can choose the model .